Download the Dresden Plate Wedge templates HERE. Cut out 10 Large wedges, 5 Medium wedges and 5 Small wedges. Take each wedge and fold right sides together lengthwise (so it looks like a long skinny strip). Stitch each end (leaving the long edge open). Press open and each end will come to a point like below. Press well. Repeat on every piece. Lay out all your pieces, 20 total. In this order, Large, Small, Large, Medium (repeat). 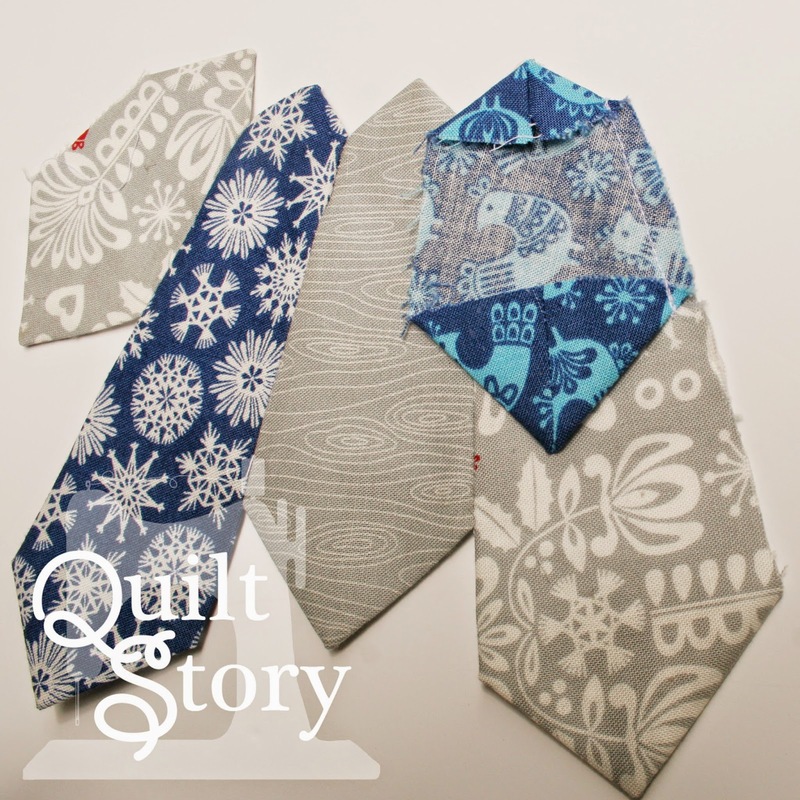 Stitch together in four sections of 5. See above and below. Stitch end to end of the shorter pieces. If you stitch over a little don't worry, it will be ironed over and you won't see it. Take care to backstitch your start and finish. Take each section of 5 and press the seems open. You'll find that the taller pieces naturally and easily fold in 1/4". See below. 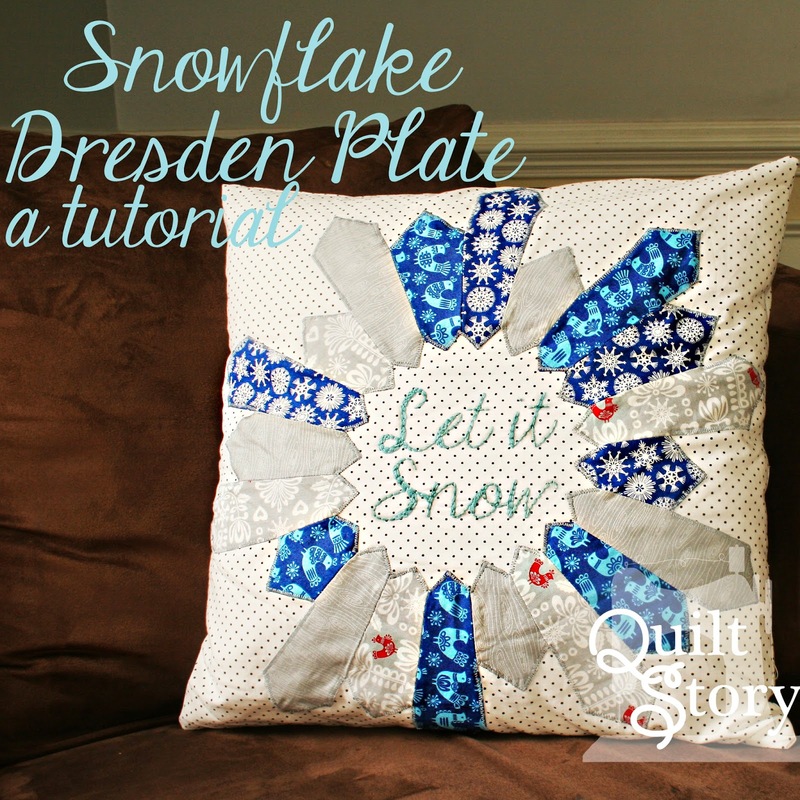 Stitch all sections together so you have a complete and continuous Snowflake Dresden Plate. 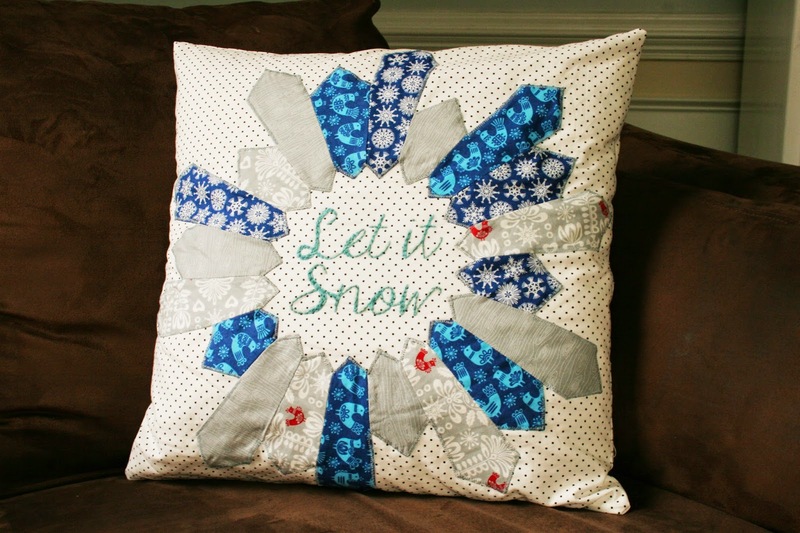 Embroidery "Let it Snow" found HERE.. Ultimately the pillow will be cut down to 18.5". However keep your piece generous until after it is embroidered and your Dresden is attached. 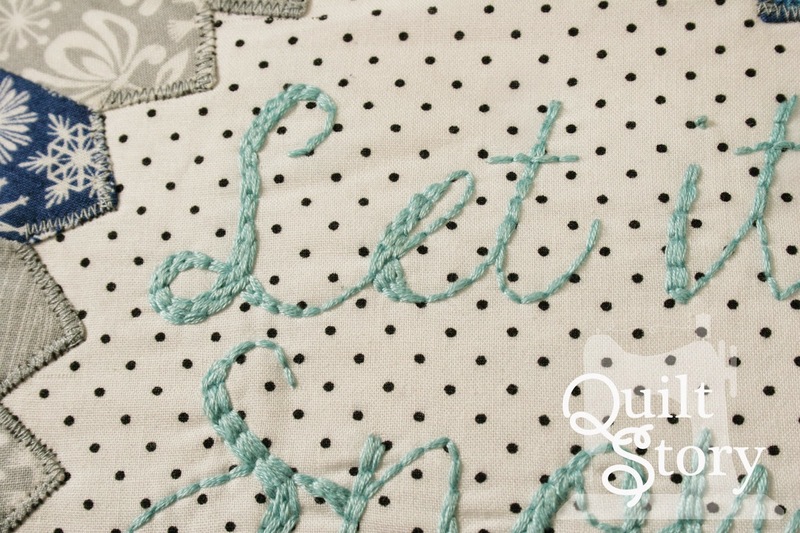 Place the "Let it Snow" underneath the fabric. Trace the letters using a temporary fabric marker. Place the generous size of felt under the fabric. You'll embroider through both pieces. The felt make it not only sturdier but you are unable to see the stitching underneath and you move from letter to letter. I used all 6 threads of floss and used a basic backstitch. (A quick google search will show you lots of tutorials if you aren't familiar). On the wider sections of the font there is a close up below so you can see how I did it. Still using a backstitch. 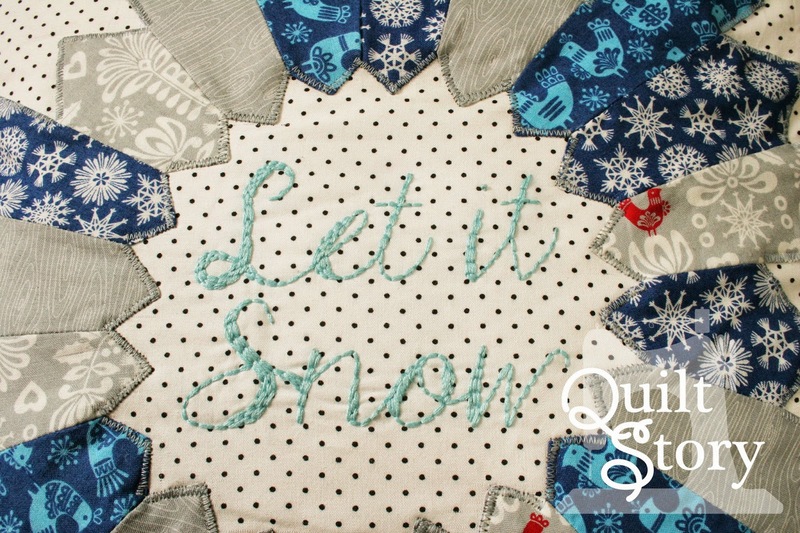 Place the Snowflake Dresden over top and center it with "Let it Snow". Carefully pin around the entire snowflake. 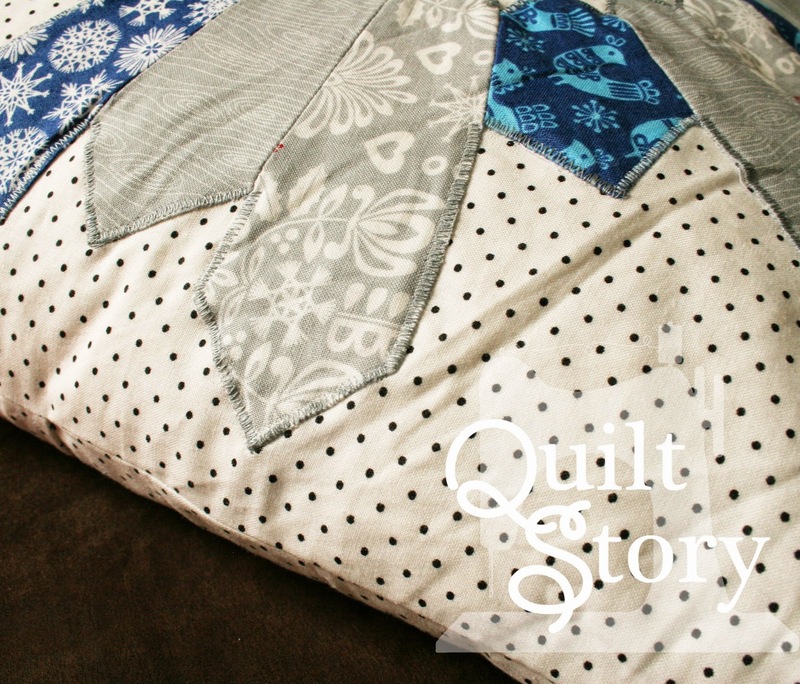 Use a tight zig-zag to attach the snowflake to the front of the pillow. Zig-zag around all the inner and outer points. You can see this above and below. Trim the pillow front to 18.5" x 18.5". I used an envelope closure in the back. Easy to do and easily removable to clean. Cut two pieces, 9" x 18.5" and 14.5" x 18.5". Turn under, press and stitch one side on each piece for a nice finished edge (below). Right sides together place the front and back envelope pieces together, pin around and use a 3/4" seam and stitch around completely. 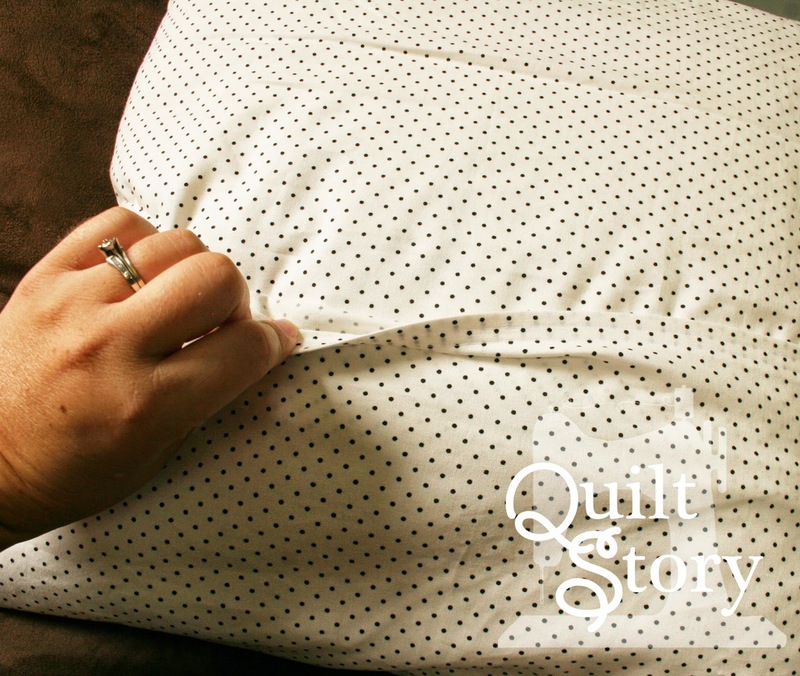 Turn pillow right side out, press and place in your pillow form! This block would be so cute done as a table topper, I thought about shrinking the size a bit and doing the regular size in the middle and two smaller snowflakes on the side. It would also make a really cute wall hanging! And of course an entire quilt would be awesome!! Here's the schedule for the blog hop and prizes...make sure to be checking Sew Lux as you go!! I love this! 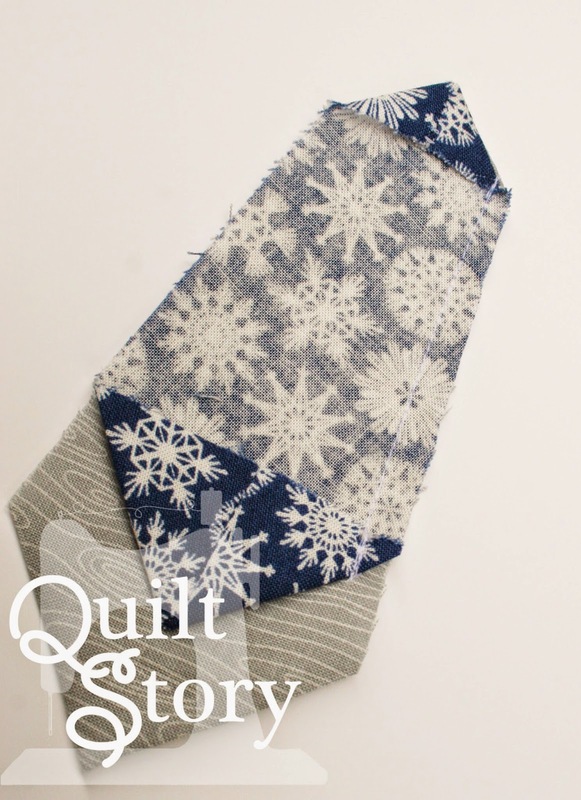 Such a clever way to use a dresden design and make it look like a snowflake!! The hand embroidery adds such a personal touch, too. Great job!! I could never make the center come out right for the Traditional Dresden. I applique this method more often than any other use of the Dresden. I like to read different writing tutorials. For example, here I found info I needed to write my paper outline. You can read it if you want.